I had been wanting this tattoo for about three years, It's been in my head for so long I'm ecstatic to get it in my skin! April 10th 2010; I got it done at Studio X in Vancouver, WA By Daniel. Thanks for all the comments! Love ya'll! May NOT be used without my permission! This is not a STOCK photo! I'd love to do that in my koi scales, but i'm to chicken of needles and bit heavy set so i will stick to sharpies or henna haha. 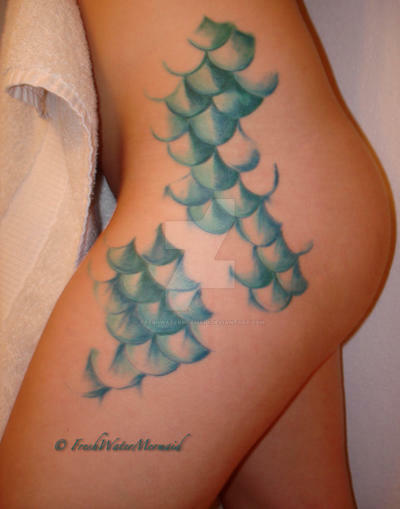 That would be cool to do a koi mermaid scale tat! love it. hail to us mermaids! So unique!!! I love it!!! So you drew this yourself? I am head over heels with your tattoo!! I love that some scales are finished and some are not. And the color turquoise is stunning. Would you mind if I used this as inspiration for my next tattoo? So many have LOL go ahead. awesome. this earned you a watch. how much does it cost you ? This is truly amazing, I've never seen anything so unique! One scale at a time! The hard part will be transitioning two legs into one tail! Nice tat!! AMAZING!! sexiest tattoo ive ever seen! I forgot to ask... is it just the one side, or do you have a matching set of scales on your right side? I also love how some are not finished, as if your skin is "changing" into them! That was the idea! Glad you got it! ^_^ Thanks! I absolutely LOVE it!!!! VERY very nice!!! I would just like to mention that my birthday was the day after you got this done, my name is Daniel, and I was actually gonna get a tat just like this. lol Funny how we are all connected. Very smooth. I especially like the color.